Arthritis is a form of joint disorder that involves inflammation in one or more joints. There are over 100 different forms of arthritis. 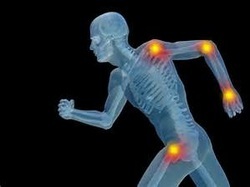 The most common form of arthritis is osteoarthritis, a result of trauma to the joint, infection of the joint, or age. Other arthritis forms are rheumatoid arthritis, psoriatic arthritis, and related autoimmune diseases. Septic arthritis is caused by joint infection. Traditional Chinese Medicine (TCM) categorizes arthritis as a blockage in the smooth flow of Qi and Blood throughout the energetic pathways in the body. The disorder is classified as Bone Bi (an impediment that affects the bones and joints). Pain and reduced range of motion in TCM indicates the presence of a blockage; conditions such as arthritis, herefore, are called Painful Obstruction Syndromes. The immediate cause of Bi syndromes is environmental. Pathogenic Influences of Wind, Cold, and Dampness are said to penetrate the body's defenses and lodge in the muscles, tendons, and joints. They create obstruction and cause pain, stiffness, and other symptoms. The confluence of these pathogens in the affected areas also can lead to the generation of Heat, manifesting as inflammation. Long-term Bi syndrome can lead to the formation of Phlegm and the deformation of bones and joints. While the Qi usually is strong enough to resist invasion by environmental pathogens, several internal disharmonies in the Qi and the Blood can predispose one to Bi syndrome. • Individuals under stress frequently suffer from obstructed flow of Qi and Blood in the body because stress affects the Liver, which is responsible for the smooth flow of Qi. Obstruction creates an environment in which the Pathogenic Influences can invade and lodge. • Insufficient Blood and Qi can lead to the body's energetic pathways being completely filled, allowing pathogens to invade. • A genetic predisposition, poor diet, overwork, and insufficient exercise can weaken the Zang Organs, such as the Kidney or Spleen (responsible for supplying the kinds of Qi that maintain overall resistance) allowing Pathogenic Influences. TCM typically does not make a diagnostic distinction between osteoarthritis and rheumatoid arthritis. Instead, it makes a diagnostic distinction based on the predominance of Wind, Cold, Damp, or Heat symptoms. • Wind Bi: Wind predominates when a patient exhibits pain that begins and ends rapidly, limits the range of comfortable movement, and moves among different parts of the body. Windy weather can make the symptoms worse. Such patients also may have an aversion to wind, have a floating pulse, and a normally colored tongue with a thin, white coating. Because this type of Bi moves from area to area, it is also known as "Wandering Bi." • Cold Bi: Cold predominates when the pain is severe, limits the range of comfortable movement, and has fixed locations. Cold temperatures worsen the condition, and warmth improves it. A patient suffering from Cold Bi may have an aversion to cold, his or her pulse may be tight, and the tongue may have a white coating. Because this type of Bi usually results in severe pain, it is also known as "Painful Bi." • Damp Bi: Damp predominates when the pain is characterized by soreness, limits the range of comfortable movement, and is accompanied by feelings of heaviness and sometimes numbness. While many areas of the body may be affected, the pain tends to remain in those places. Dampness worsens the condition and there may be swelling in the affected areas. These patients usually have an aversion to damp weather. Their pulse may be slippery and their tongue may have a greasy coating. Because this type of Bi is characterized by fixed areas of pain and sensations of heaviness, it is also known as "Fixed Bi." • Heat Bi: Heat predominates when a Wind-Cold-Damp syndrome results in a greatly reduced flow of Qi and Blood through a joint, causing constraint. Constraint in TCM theory can cause Heat. Heat Bi is characterized by inflamed, red, swollen joints. The tongue may be red with a yellow coating, and the pulse may be rapid. Though a generalization, osteoarthritis frequently falls into the categories of Wind, Cold, and Damp Bi, and rheumatoid arthritis into Heat Bi.